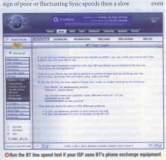 kitz.co.uk gets mentioned in Computer Active Magazine Issue 293 for tips on improving your broadband connection. kitz.co.uk gets various mentions in a special edition magazine "Ultimate Guide to Solving PC Problems" by Computer Active. Feature: Various mentions throughout the magazine both as references & guides and where to go for more information. "For broadband and internet issues try Think Broadband or Kitz". 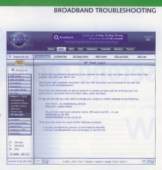 "You can find even more troubleshooting advice at www.kitz.co.uk"
The site gets several mentions in a Boost your Broadband special feature on troubleshooting and how to improve your broadband speeds in PCW. Item: Personal Computer World Magazine. The site gets several mentions in a Computer Active Magazine special feature on how to Speed up your broadband. 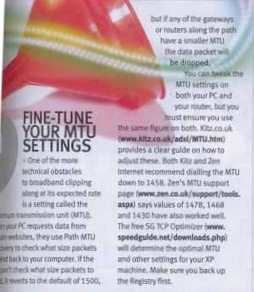 Feature: "Broadband Test it - Fix it - Boost it"
PC Pro Magazine Feature "Double your Broadband", made mention of the site stating it "provides a clear guide" on how to tweak your MTU settings to help improve your broadband speeds. BBC Radio Derby does a special on broadband speeds with Which Magazine. Both the kitz.co.uk main site and forums get a mention by the radio presenter as being a good site for broadband information and help with adsl problems. A Webuser Magazine reader got £25 for mentioning the site on readers "top tip" on how you could find out if you could get better adsl speeds. Issue 168 page 68. The site was featured in the UK National Magazine Webuser Issue 161 in an article about "Boost Your Broadband".